Connie has some good tips for us all regarding importing images into Adobe Lightroom Classic CC. Read her premium article. New buttons in the forums are being provided later today to simplify upload of images and to include these in forum posts. By using the button "Upload images" in the top of any forum, you can select multiple images for upload. The images will be uploaded to your gallery and linked in the post you are making. You can also decide to not show the images in your gallery, but only in the post. In this case the images are still uploaded to the galleries, but rather than under your own gallery, they will be placed in a system-specific area. More information on this in the About Nikonians forum. We are proud to announce the Winners of the Annual Best of Nikonians 2018 Contest. Once again, the quality of the images submitted this year has been outstanding. We are extremely proud of the level of photographic accomplishment of our membership. Please stop by to see the full images and congratulate the winners. I am wishing you a splendid rest of the week, with some good light and great subjects. Red & Black. Caught This Anhinga flying - I tried to create an abstract. By Preston Moochnek (massulo). See his complete portfolio. The winners of the Best of Nikonians 2018 contest have been announced. Once again, the quality of the images submitted this year has been outstanding. We are extremely proud of the level of photographic accomplishment of our membership. An international team of Judges, from eight countries, were drawn from the Nikonians Master's Society to grade the one hundred and twelve qualifying finalist images. See all winners. Several members have already registered for the 19th ANPAT in the Spring but there is still room for you. Don't miss this opportunity to capture the extraordinary birds migration into Cape May, NJ and very interesting scenery in Pennsylvania. For details check the Nikonians Annual Photo Adventure Trips (ANPATs) forum. Once again, the quality of the images submitted this year has been outstanding. We are extremely proud of the level of photographic accomplishment of our membership. An international team of Judges, from eight countries, were drawn from the Nikonians Master's Society to grade the one hundred and twelve qualifying finalist images. The Nikonians Certificate of High Photographic Achievement. A prize from our contest sponsors or a membership extension. Are you getting ready for this season of outdoor photography? If you are one of us not shooting outdoors already, but rather still preparing yourself we have some tips for you. 1. Upload one or two of your 2018 raw (NEF) images to receive helpful critique and processing advice. You do this in the Premium Advice & Critique forum, available to all Platinum and Gold members. If you are not on a Gold membership yet, just use the voucher below. 3. Read Daniel Stainer's (spiritualized67) great article on how to chase-away the winter blues. I am wishing you good posting, new friends & great reading! 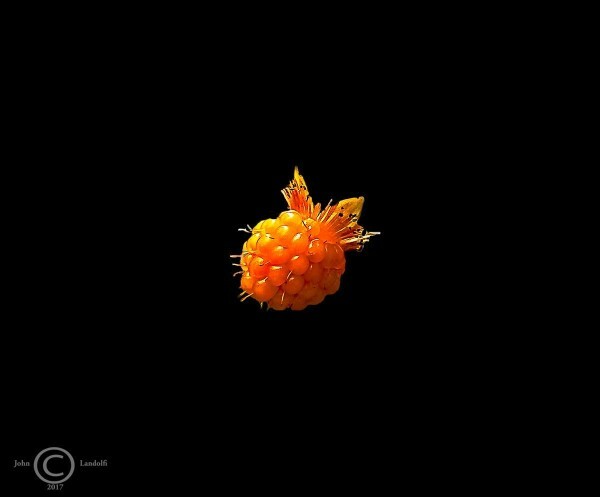 Salmon Berry by John Landolfi (johnlandolfi). See his complete portfolio. The voucher "SpringPrep19" is valid thru Feburary 11th, 2019 and entitles you to a significant deduction on a Gold membership ($50 instead of $75 USD). Use the voucher on the upgrade page. In addition to the Premium Critique with NEF upload access, your new portfolio awaits you. You also have your own Nikonians email address, photographer's ID plus more. If you are selling some of your work and it is more than a hobby, this discussion on taxes in the US might be of interest to you. See the complete thread. The final polls have been closed, the winners have been advanced, and the jury has been seated. We are in the process of choosing the winners of our premier contest, the Best of Nikonians 2018. All the images that have won in our forum contests during 2018 are eligible for this annual contest. We expect to announce the finale winners before February 15th. We have posted detailed information about the judging process in the Nikonians Blog. And, the February contests are on their way. 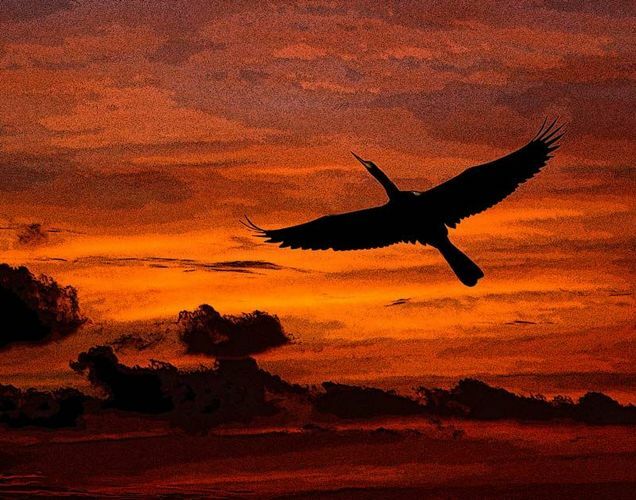 Are you a bird photographer? If you are interest in bird photography, this trip might be for you. The ANPAT 19 Spring is ready for booking and takes you to Cape May and Southeastern Pennsylvania. 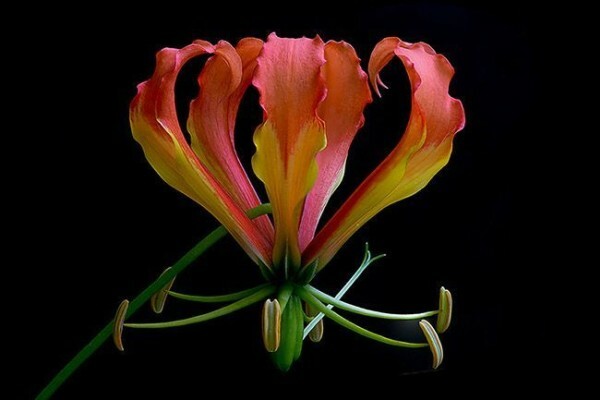 You will also have the chance to shoot great flowers, landscape and architecture. All of our contests and polls have been updated for February. All contests are open for entry, Silver, Gold and Platinum members are eligible. All members are eligible to vote in the polls. You choose the winners, make your vote count. Below is a list of all contests and polls. How do we choose images for the Best of Nikonians Contest? The contests that we run in the forums throughout the year are the preliminary rounds for our premier event, The Best of Nikonians. 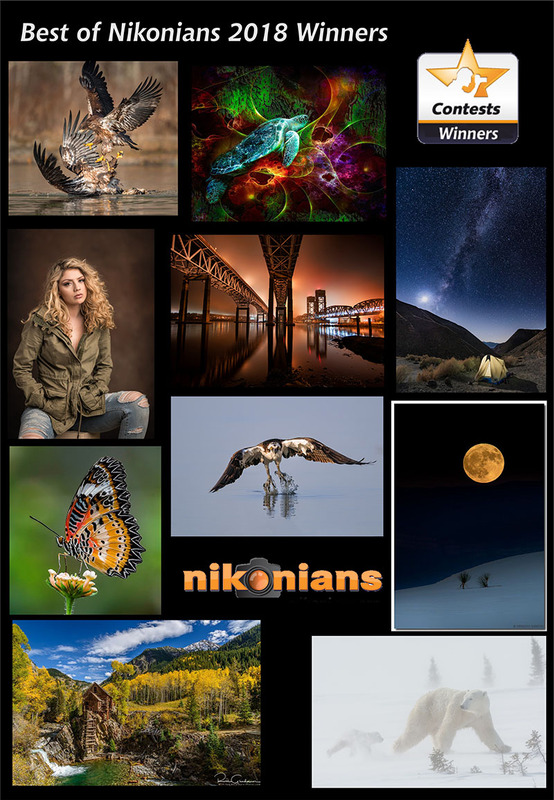 Each winning image is added to the Best of Nikonians galleries. 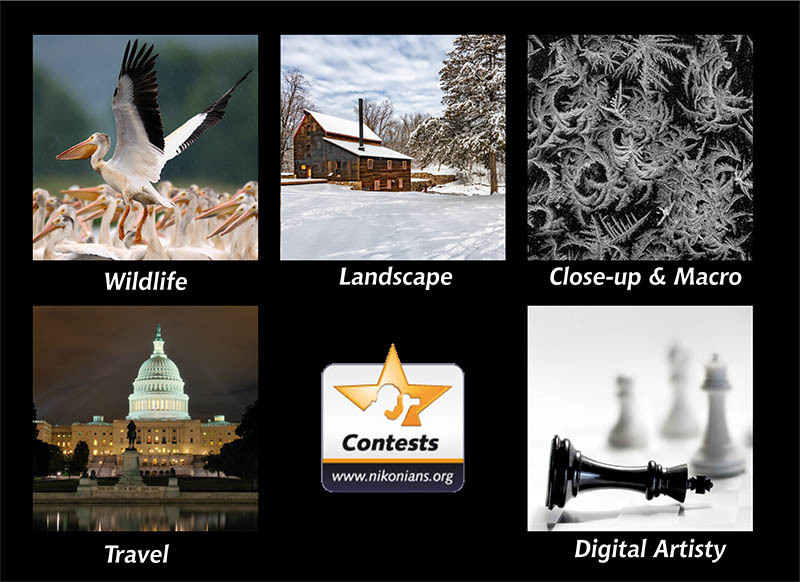 The December contests winners are the final images to be eligible for the current years' contests. The voting for the December contests are carried out in January, so judging process is scheduled to begin on the first day of February each year. Who makes up the the jury? The jury in for the Best of Nikonians Contest are members of the Nikonians Masters Society, a select group of highly experienced, advanced photographers, representing a wide range of photographic disciplines that is chosen by the founders of Nikonians. How are the images evaluated? The images are presented to the jury without members names or any other context. Images are evaluated on their own merit as stand-alone images without bias as to the subject matter, technique, or difficulty of getting the shot. Jurors will assign a numerical sore between 10 and 50 for each image. A score of 50 - Indicates an Exceptional Image. This is not necessarily a perfect image, but a work of photographic excellence. The image should not have any oblivious flaws and a high level of impact on the viewer. A score of 40 - Indicates a Very Strong Image. These images are technically correct and impactful. Image elements should work together to keep the viewer engaged. Any flaws are minor and/or hard to identify. A Score of 30 - Indicates an above average image. These images demonstrate a strong composition and solid technical skill. A Score of 20 - Indicates a good image. This image will have no major flaws. It will have little impact and not keep a viewer engaged. A Score of 10 - Indicates a poor image. The final scores are determined by scoring each image on five criteria. Each criteria is scored 1-10, then all are then added together for the final score. - Overall Impact: This is about how did you feel about the image at your first look, before a close examination... What impression does it make on you? - from dull to exhilarating, mysterious, captivating, etc. Does the image have emotional appeal? Was you first impression of the image 'so..so..' or 'good' or 'very good', or 'Wow'? - Color/Tone: If color, how does the use color impact the overall image? Are the colors and tones appropriate for the subject matter? If black and white, is the image toned appropriately for the subject matter? - Composition: Does it keep the viewer engaged? Are you drawn to the subject? Does the image have good balance? or Does it feel awkward or uncomfortable to view? - Technical Execution: Look for... Proper exposure, appropriate depth of field, quality of lighting, good focus, distractions. - Story/Message: Does the image tell a story? Does the image convey a message? Does the image stand on its own, without a title, caption or other explanation? Can you interpret the intent of the photographer? Does the image advance awareness of a subject or an issue? The top ten scoring images will be the winners. If any one member has more than one image in the top ten, then their highest scoring image is selected and any other are removed advancing the next highest scoring image. In the end we will have ten images by ten separate members announced as winners. Winners will be announced before February 15th. Good luck to all who have entered. To see all of the eligible 2019 images go The Best of Nikonians - 2018 Images gallery.